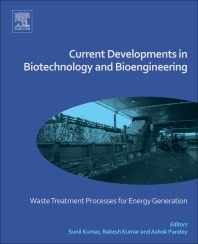 Current Developments in Biotechnology and Bioengineering: Waste Treatment Processes for Energy Generation provides extensive research on the role of waste management processes/technologies for energy generation. The enormous increase of waste materials generated by human activity and its potentially harmful effects on the environment and public health have led to an increasing awareness of an urgent need to adopt scientific methods for the safe disposal of wastes. This book outlines the basic knowledge, processes and technologies for the generation of energy from waste and functions as an important reference for academics and practitioners at varying levels of interest and knowledge. The book's content encompasses all issues for energy recovery from waste in a very clear and simple manner, acting as a comprehensive resource for anyone seeking an understanding on the topic. Dr. Sunil Kumar is a Senior Scientist at CSIR–National Environmental Engineering Research Institute, Nagpur, India. Dr. Kumar has extensive experience in the field of solid and hazardous waste management and has over 80 publications and communications, which include three books and eight book chapters, and has an H index of 24 and more than 3700 citations. Dr. Rakesh Kumar is a Director of National Environmental Engineering Research Institute (NEERI), a constituent laboratory of Council of Scientific and Industrial Research (CSIR) working under the umbrella of Ministry of Science and Technology, Government of India, New Delhi. Dr. Kumar is one of the leading personalities in the field of Environmental Science and Technology. His major research interests include a wide range of environment science and engineering topics. He has 135 publications / communications, which includes 11 patents, 5 books, 15 book chapters.